Is MAP in Food and Water? The articles and booklets provided here have been generously donated by the authors or publishers for the purpose of educating animal owners and veterinarians. Some of the articles were written some time ago, but the information is still very relevant. Please feel free to download and distribute them to others but please also credit the source of these materials. Johne’s disease is common in goats. This helpful brochure for goat owners and producers is focused on managing Johne’s disease. Feel free to download, print or forward them to your breeder clubs, 4H groups, FFA organizations, and other associations and clubs for meat, dairy, fleece or fiber production goats. Click here to download 432 KB pdf document. 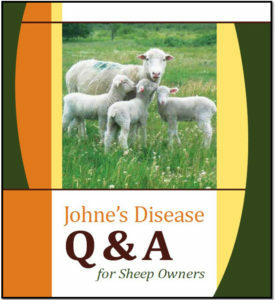 This helpful brochure for sheep producers is focused on managing Johne’s disease. Feel free to download, print or forward them to your breeder clubs, 4H groups, FFA organizations, and other associations and clubs for meat, dairy, fleece or fiber production sheep. Click here to download this 500KB pdf document. Johne's disease is very common in goats and sheep. THese two booklets will help understand the disease and how to control or even eradicate this infection from herds or flocks. 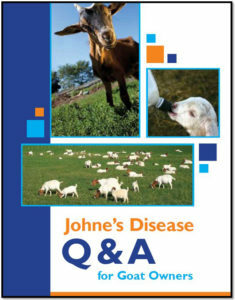 *If you have questions about Johne's disease please submit your question on the "Ask an Expert" page.